A memorandum of understanding was signed Monday afternoon in Abuja, signed by some leaders of a faction of the All Progressive Congress (APC) and opposition parties for the general elections of 2019. 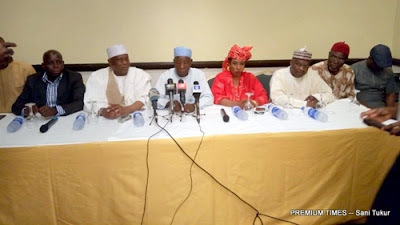 According to PREMIUM Times, Reformed members of the APC (R-APC) were led to the event on Monday by their leader, Buba Galadima, who met opposition party leaders such as the PDP and the SDP to sign the protocol of agreement. It was gathered that, apart from Galadima, others at PDP's Monday meeting include Senate Vice President Ike Ekweremadu, former Vice President Atiku Abubakar, Senator Dino Melaye and Governor of Akwa Ibom. While informing reporters, a former senator, Ben Obi, said the parties have come together to sign a memorandum for a coalition that will take office in 2019. He described the 2019 election as a battle between light and dark, saying the coalition is the light that came to save Nigeria. He said the signing of the memorandum is a signal to the ruling APC and the international community that they are ready to take power in 2019.